I Love You More Than Carrots: Reveling In The Small Victories. Like Long-Sleeves and Bailey's. Reveling In The Small Victories. Like Long-Sleeves and Bailey's. Plans have been made. We're taking a field trip. We're up bright and early and waiting for our sweet friends to come pick us up. I may or may not have splashed a small bit of Bailey's into my morning coffee. We're off to take 2 under 2 to a nearby pumpkin farm. Complete with tractor playgrounds, corn mazes and a small petting farm. And? We're wearing long sleeves. Friends, this is already quite an accomplished morning. I feel like I can do anything! Okay, well, not anything. At least until I finish this first cup of coffee. Good thing I snapped a few pictures of Carter in his pumpkin-picking shirt this morning. Because now? He's currently drawing all over himself with the purple pen I said he could have so that Mommy could bang out this blog post. Reveling in the small victories today... Happy Tuesday, Loyals! Suddenly my super-soberito coffee with extra-boring-FF-halfnhalf is so. freakin. lame. Sigh. Have fun! Yay for Fall! Aw have so much fun!! I want to do a pumkin patch so bad with C. Take lots of pics! No shame in a little Bailey's. No shame at all. If my husband had my job, he'd be drinking ALL DAY LONG. Mmmm bailey's sounds delish after the sicky/screamy week we had! C looks so old!! Can't wait to see cute pumpkin pics! Umm another Mommy that daily (you did say daily right?!?!) adds Bailey's to her coffee?! We were so meant to be bff's. Love this post! It's all about "choosing your battles" with a toddler - I'm learning that all too well these days! GO AP!! Long sleeves and a field trip? You are certainly a pro! Have fun picking pumpkins! Seriously he looks HUGE!!!! Where's your baybee!? The l/s shirt thing is way too hilarious! Guess a little spiked coffee is one way to help get them on. 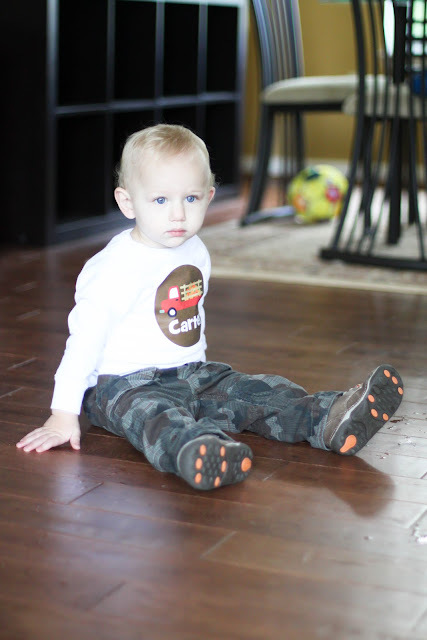 :) I just love how many things Carter wears with his name on it! I know you're a bit of a creamer lover....have you seen the new Bailey's ones? Now they don't have the booze...but I've been dying to try them! Glad you won the long sleeved battle! What a doll! And I mean that in a totally masculine way of course! Yay for your great day from long-sleeves to Bailey's to pumpkin patches. We went to a pumpkin patch this weekend (in summer clothes) but we didn't sweat our asses off which was nice! This post makes me super excited to head to the pumpkin patch as well!